Several useful things came my way over the past few months, a hodgepodge of small delights. 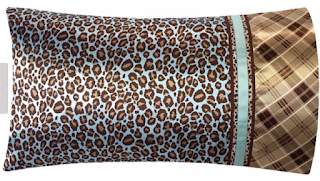 Each may be useful to you, and would also make a good house or hostess gift. We moved into a condo with wood floors, a surface I had not had in a dining area for decades. 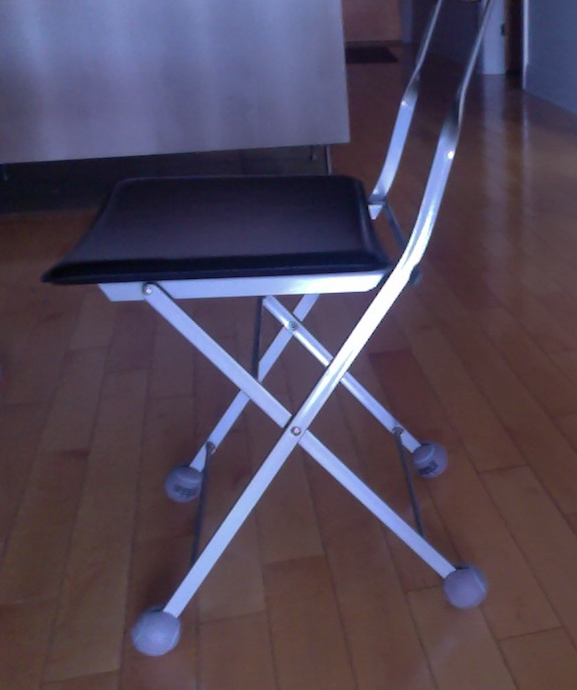 I tried every kind of pad under the dining chairs' metal legs to prevent scratching: felt, deluxe felt, hand-cut felt. After nearly every meal, someone would skootch his chair back leaving mangled pads and adhesive smudges on the floor. Finally, I found Chair Slippers. They work perfectly, and what a relief to see the floor no longer more damaged by the week! Some people use tennis balls, but the Slippers, which come in three sizes and many colours, are less conspicuous. Gave this to a GF for her birthday and she wondered where it has been all her life. Well, you really don't need one all your life, just after 50 when you get those chin bristles and upper-lip fuzz. 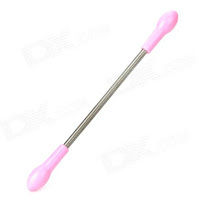 You can spend $17 on a Bellabe, or a buck or so on this one on eBay, slightly smaller but works just as well; guess which I buy? "My baby don't care for rings, or other expensive things, my baby just cares for... toothpaste." Why not? You put toothpaste in your mouth several times a day, right? None of those nasty microbeads, a pleasing taste, and a gorgeous retro Italian tube. The Ginger Mint variety is delicious too. I can get it cheaper across the street, but if you don't live near Italian things, it's on Amazon. Reader Carolyn from Oregon found this jewelry accessory; she wears several pendants on thin gold chains, and they tangle. She has not ordered one yet, and is pondering whether she'd be pleased with gold fill. Unless you have high-karat gold (18 or 22k) I'll bet the gold fill will be fine, but you'd want the option to return if not. 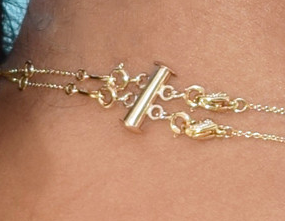 You could make this yourself, for less (or if you want to invest in a gold clasp, around $130 or more). The clasp is a multi-strand like those used for two or three-strand pearl necklaces, with an additional jump rings added, so there is a fastening for both the hook and eye sides of the original chains. You remove the necklaces by simply lifting the vertical pin in the clasp. The Strandalign is available in both silver and gold-filled models, for $US33 to $49; free shipping in US; international shipping available. 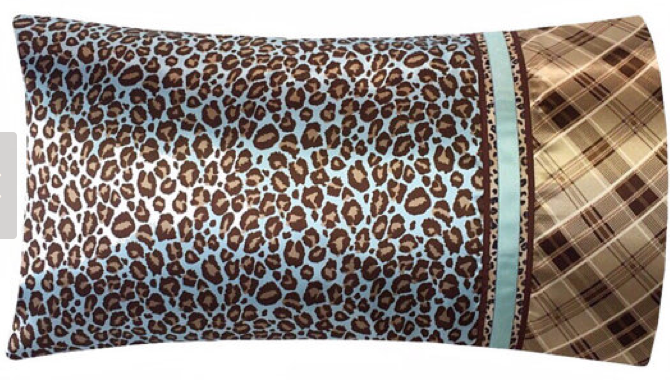 If you are coping with hair loss, or, like one of my best friends, have temporarily lost all your hair, a satin pillowcase is an excellent choice—and why not rock out with leopard? Not cheap (about $65 plus shipping from Etsy seller SatinSwank) but a personal-care treat. Maybe when you see these, you'll contribute your own, via a comment—I would enjoy learning of your small treasures, the objects that, now that they're in your life, you wonder how you lived without. Those chair slippers are brilliant! 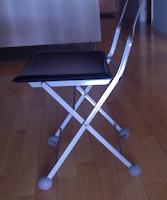 When we moved into our hardwood floored apartment, I spent a LONG time putting little pads on the bottoms of everything, only to find that if you actually USE a chair regularly, the pads will slide off or wear down. Slippers - into my shopping basket! I don't need chair slippers, at least for the moment, but I did follow your suggestion and picked up a pair of Glerups for Pater, who thanks you! They're great, and as soon as I wear out my sheepskin-lined mocs, I'll be getting a pair for myself. I loved your last post, even as I'm having a certain sedate kind of fun in Rome (and just finished reading a book about a 17-year-old visiting the city in the 70s, having the more exuberant version I vaguely recall. . .
Oh, and you've reminded me to (finally) grab a tube of Marvis to bring home. All these years hearing its wonders extolled. Time to join the party! Those chair slippers look great although they wouldn't work for mine as the legs are connected along the floor. Several years ago I marked up my new kitchen floor quite nicely using the 'protectors' that came with the chairs. I now have better ones but the damage has been done, so aggravating. My little finds? This winter I got tired of not being able to see my clothes inside my armoire so got an LED light about the size and shape of a hockey puck from CTire and stuck it on the inside of the door with double sided tape. What an improvement. Most important of all, I hope your friend is doing well. Yes, that is the least for her to have. Would she like the soft Parkhurst cotton bérets, nice to wear even at home with hair loss (assume this is due to chemo) to prevent being chilly, and not harsh as many other headgear can be (can also go under another hat). They have them all at Haya Kova, a shop that specializes in wigs and hats for a) people with medical issues and b)"modest" women, usually religious, at the other end of the 160 bus route, in a most unprepossessing "dead mall". I like Marvis, but I need sensitive teeth toothpaste now, and they don't sell it in that brand at Caffé Italia... There is a shop in Amsterdam that sells ONLY toothbrushes and related paraphernalia; I picked up something nice there, but it is long gone. lagatta: Yes,she has bought an almost incalculable amount of scarf-wrap-hat items from many online sites! I buy Marvis at Milano, they have (usually) all the flavours.